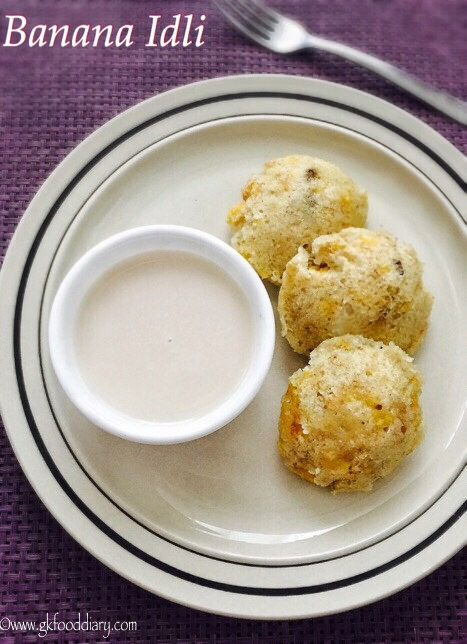 Instant banana idli – a quick, no grind, no fermentation idlis are made with banana, sooji/ rava (cream of wheat) and poha. Banana Recipes are clear winner for kids. As I have mentioned earlier, my little daughter loves banana so I take chances to try different varieties with it. I have seen sweet idli recipe in a cookbook some time back and I modified the recipe to add bananas instead of more sweetener and came out too good:) No surprise my dd loved it 🙂 This banana idli can be given to babies after 8 months as a quick breakfast. 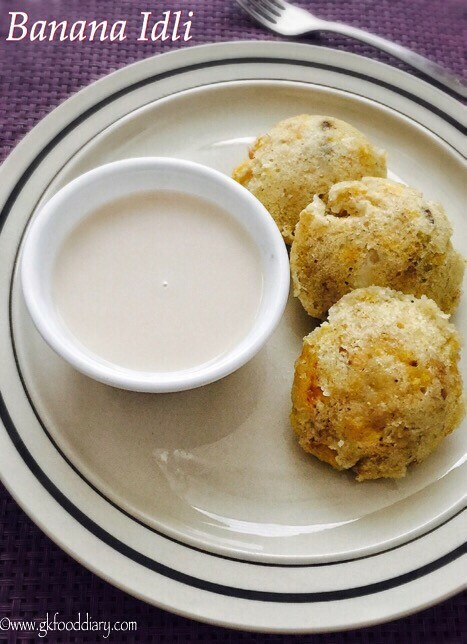 Do try once for your little one and family and enjoy this delicious idlis. Now Let’s get on to check how to make this easy instant banana idli recipe for babies, toddlers & kids. Measure poha and sooji/rava. Add water to jaggery till it immersed level and melt it. Set the jaggery syrup aside. Keep all other ingredients ready. Soak poha in water 5 minute or until soft. I used thick poha variety and it was soft enough to mash with 5 minutes of soaking. Thin variety poha might take little longer time. 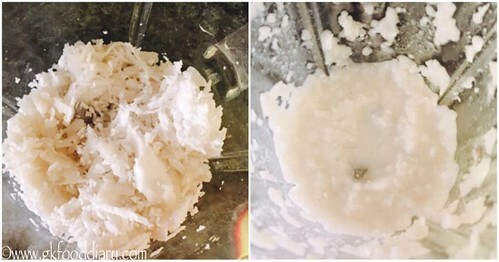 Grind the soaked poha and grated coconut with little water to a smooth paste. Mash the bananas well with hand or fork. Now in a vessel, add rava, poha coconut paste, jaggery syrup, ghee, cashews, raisins with pinch of salt. Mix everything well. Add water and let it sit for 15-30 minutes. 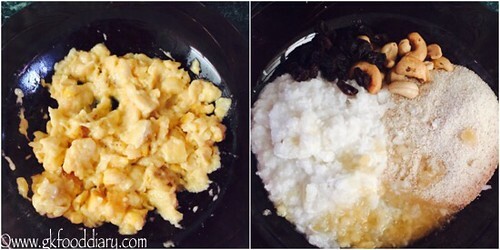 After 15-30 minutes, poha and rava absorbed most of the water content. Hence adjust with water to make it idli batter consistency that is neither too thick nor thin. Add baking soda if using. Now start making idlis, pour the batter in each idli mould. Steam it with a cup of water for 10 to 12 minutes in medium flame. 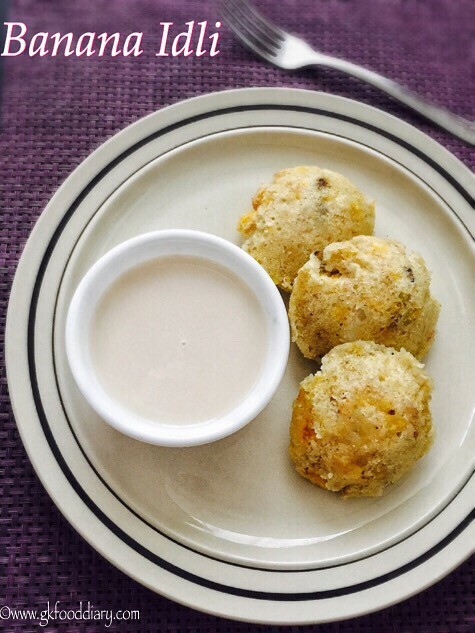 Check with a spoon, if it's coming clean, the Idlis are ready! Switch off the flame and remove from moulds. 1. Measure poha and sooji/rava. Add water to jaggery till it immersed level and melt it. Set the jaggery syrup aside. Keep all other ingredients ready. Soak poha in water 5 minute or until soft. I used thick poha variety and it was soft enough to mash with 5 minutes of soaking. Thin variety poha might take little longer time. Grind the soaked poha and grated coconut with little water to a smooth paste. 2. Mash the bananas well with hand or fork. Now in a vessel, add rava, poha coconut paste, jaggery syrup, ghee, cashews, raisins with pinch of salt. Mix everything well. Add water and let it sit for 15-30 minutes. 3. After 15-30 minutes, poha and rava absorbed most of the water content. Hence adjust with water to make it idli batter consistency that is neither too thick nor thin. Add baking soda if using. Now start making idlis, pour the batter in each idli mould. 4. Steam it with a cup of water for 10 to 12 minutes in medium flame. 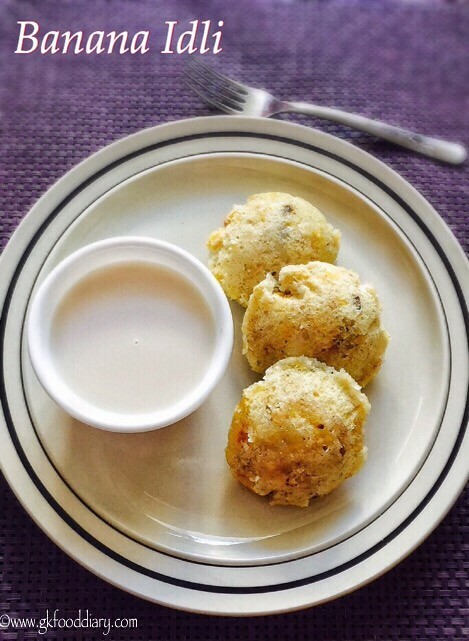 Check with a spoon, if it’s coming clean, the Idlis are ready! Switch off the flame and remove from moulds. The instant banana idlies are ready to serve! Serve it plain or tastes best with coconut milk! Hope you liked this recipe. If you wish to get regular updates, do like my facebook page GKFoodDiary or follow me through Google+,Twitter & Pintrest! The same recipe can be tried with wheat rava instead of sooji. I have used Nendran Kerala banana. You can use any banana variety. For small babies skip whole cashews and raisins. Instead use powdered nuts. I used thick poha variety and it was soft enough to mash with 5 minutes of soaking. Thin variety poha might take little longer. 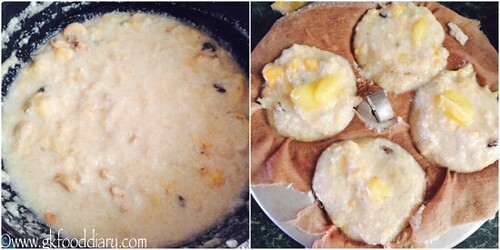 Give at least 15-30 minutes or even an hour of sitting time once the batter is ready. That gives softest idlies without using baking soda. This banana idli batter can be fermented for some 5 hours. It keeps well for a day or two in refrigerator if baking soda is not added. Skip salt, jaggery, coconut and baking soda for babies below one year. 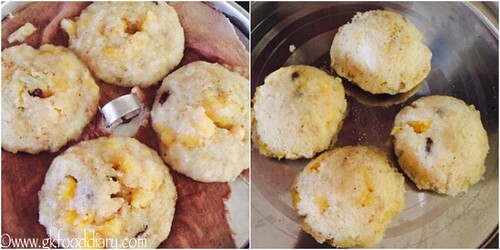 Make sure to introduce each ingredients separate to your baby, before you try this banana idli recipe. When using kendram banana for 8 months old baby how to select the banana? Do we need to buy raw nendran or ripen nendran? If ripen one which stage , just ripen and still firm or fully ripen with black dots on the skin? Please reply. Thanks in advance. Fully Ripen Nendran banana with black dots is good. For babies below 2 years always steam Nendran banana to ensure easier digestion. I tried making banana idlis today. However, it jus did not turn up the way it is shown in the picture. I mean, after steamimg them in idli vessel for 12 mins, he idlis did not puff ou. It was more like banna sheera dan idlis. I skiped baking soda, salt and coconut. Ppease suggest what wud have went wrong ? If you skip baking soda, the batter should be fermented for at least 30 minutes. The more the resting time the idlis are soft. Second thing, the steaming time of the idlies may vary depends on the idli vessel used. Mine is aluminium and it will be done quickly. Hence always check with a toothpick or spoon if it doesn’t come clean, cook for more time , may be it takes 20 minutes too in stainless steel vessel . Hope it helps. Please update with your feedback further. You skipped,the baking soda and salt and,coconut. That’s 3,ingredients. Ofcourse it won’t come out right. The baking soda what makes,it puff up. Follow the,recipe and maybe it will come out right. Why did you skip 3 ingredients ?